Not a bad month with a 20% increase at SS balancing out losses at IS. For me August was up slightly from July, but still down significantly from last August. As usual, the culprits in the downturn are Istock and Fotolia. Other sites holding their value year on year and month on month. Alamy- (Tons of zooms including a few using the file number itself so hoping this means some decent sales will show up soon - it's been a drought there lately). Fine Art America - continuing to get sales every month. August was average month for me. Dls were below average for the year and down a bit from July. Less then half of my average in years past. 4 ELS, one on a Vetta image brought RPD up to over $20. 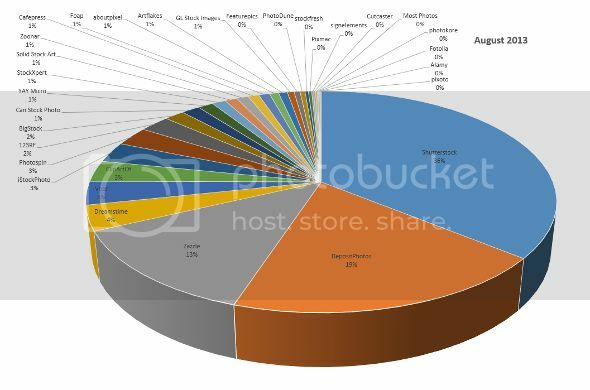 Payout from iStock on Getty for July was strong with high payouts on a handful of sales. pushing RPD even higher than $20 if counted as August. Despite a BME the continuing low dls on iStock and sporadic sales on Getty , even if high dollar, leaves me a bit pessimistic. Overall a good month.... better than June and July 2013. Not a good month overall - I made little more than half of what I made in July. August is thus far the worst month this year. Let's hope fall is picking up again. Up 26% over August 2012, up 35% year over year (last 12 months over previous 12 months). Been non exclusive (from DT) for a couple of years now, but interesting to see they are still 50% of my revenue. Given that I dropped earnings by about 50% when I left, I can't see it is an obvious choice, one way or the other Certainly not as obvious a choice as some people like to make out! That said, I basically sat flat for a year as DT trailed off and the other sites picked up the slack in revenue. But now, starting to see lots of growth again as I hit higher royalty rates on those sites - but the fact that DT remains at 50% means it is growing for me too! Interesting....when i dropped exclusivity from DT my revenue dropped at 1/3 from what used to be, and never recovered; despite the fact that my portfolio is now increased by 250%.... SS filled the gap from the first month. Congrats for your success there. Clearly I am one of the few who seems to be very well suited to sales on DT. 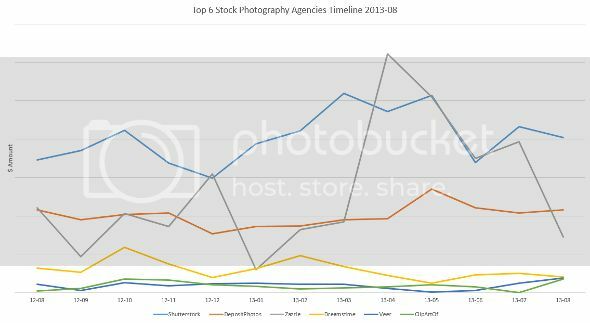 I only wish my ratio of sales on Shutterstock to DT matched the ratio in the poll results Fotolia, for me, is outsold by DT by about 20x, yet in the poll results it often / always ranks higher. Just goes to show you that although there are averages, none of us is average! 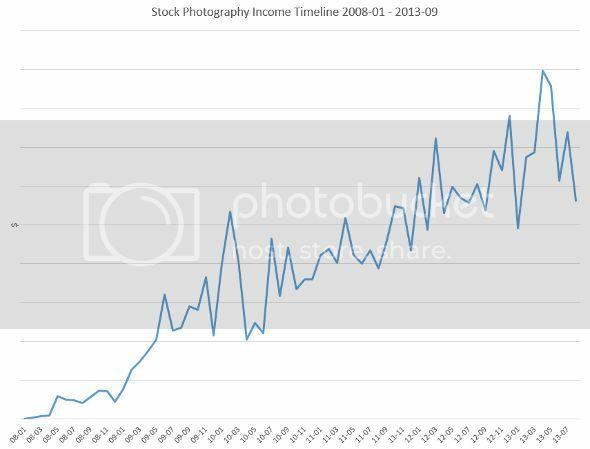 My month at istock was horrible and GI sales will be much lower than average. Please like me now. . See I even put a smiley in my post. surely you have noticed by now that anything positive even hinted at regarding GI or IS is cause for anguish. and if you are doing well there is this twisted logic that you need to verify it or else your claims are truly false. i too had a miserable month at IS, down several thousand percent from yesterday, last month, and even last year, and over at GI i did not have one sale at all, and never have. i think this might be because all the buyers have left. Aug was mixed. down 15% from Aug '12, which at the time was my BME. iS was down a bit from July, but down 65% from Aug '12. The new policies at iS have really screwed me, although partner sales are steady. Boy oh boy it sure looks to me that the lot of you see Stock Photography as a Gift Horse. Remember the old saying "Don't look a gift horse in the mouth"
What did you do Before you started selling Stock Photos? Are you really that tied into what you earn on stock photos or do you (like me) enjoy the income as one of your Multiple Income Streams? I see so many people crying about sales down or non existent, but they never do anything about it. Try going out and TAKING MORE SELLABLE PHOTOS!! I have Over 11,000 Fantastic Quality Images that Sell like Hot Cakes! But then again I am the Best! Is this post supposed to be a joke? Hard to believe it is intended to be taken seriously. Now I know the answer to my question. Look and learn Lisa. Look and learn! I sold illustrations and did graphic design... Oh wait, I still do that. Does that mean I can continue to complain?